The main principle of a ventilated façade cladding system is that the supportive battens/rails are fitted vertically to the building structure and airflow is allowed to flow from the bottom to the top and out behind the cladding panels. This creates a dry substructure which pushes any moisture out and adds to the insulation of the building. 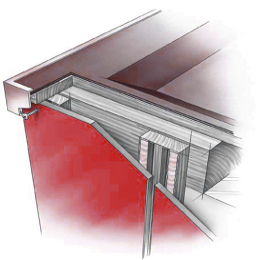 In order to create this rainscreen cladding standout there are a variety of fixing methods which are outlined in this section. The fixing methods and accessories outlined will offer a solution for the fixing of façade cladding back to aluminium or timber frames. The two most commonly used fixing methods are secret fix or mechanical secret fix and face fix, which uses screws and rivets. The adhesive fix method is becoming increasingly popular due to the contemporary trends in architecture, providing the structure with a sleek, finished look . We also supply the associated fixing or adhesive accessories, such as corner profiles, trims, gasket and horizontal joint profiles. BBS Facades also supply colour coated screws and rivets to fit the cladding panels back to the hanger, rail or batten. Please see below details of the three main fixing methods to fit decorative cladding. A Mechanical Secret Fix method allows designers to gain a clean, sleek façade, unobstructed by fixings. 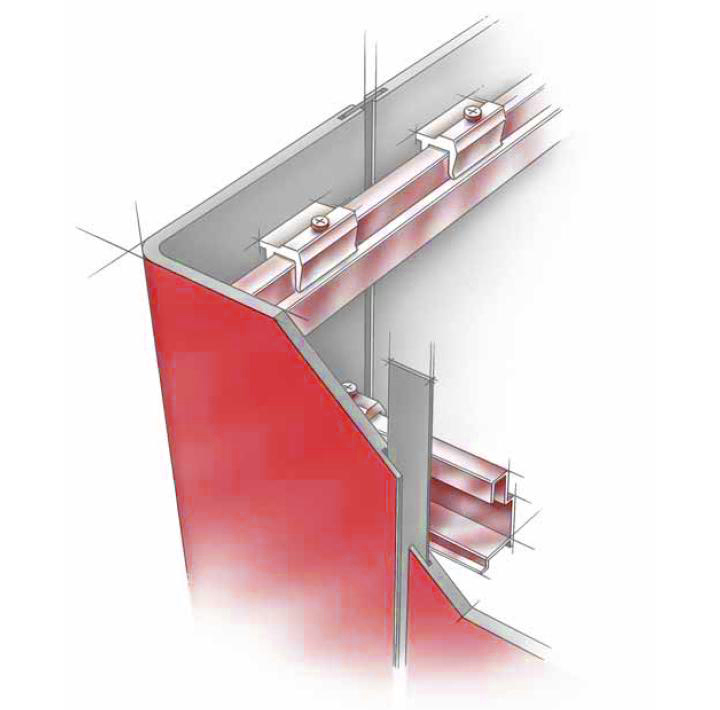 The mechanical secret fix is achieved by using an aluminium framing system consisting of hangers fixed to the back of the cladding panels. The mechanical secret fix system varies depending on the façade and material. For more information or advice, contact your local branch. The most commonly used fixing method is the adhesive fix. 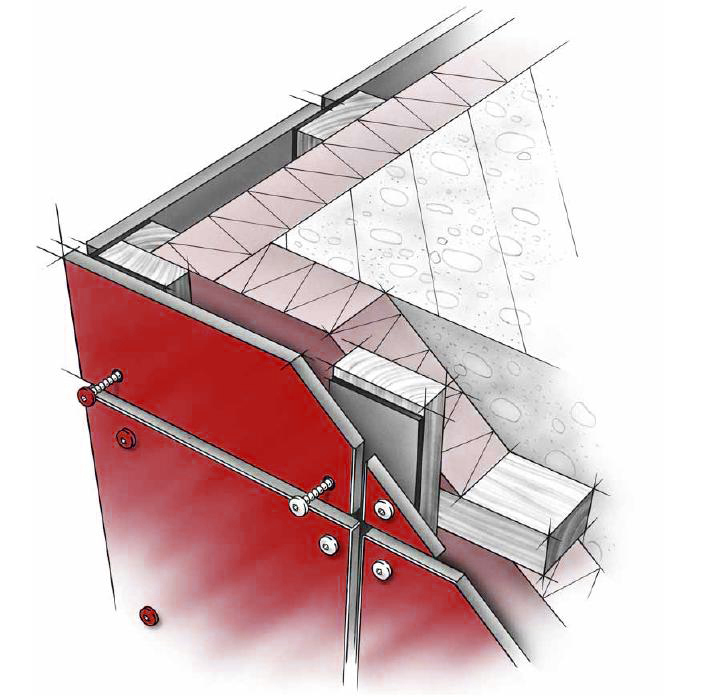 The adhesive fix method is the cost effective alternative to the mechanical secret fix which allows for adhesive to be applied to timber or aluminium framing system. Adhesive can be used within a temperature range of +5 to +35 degrees with air humidity of no more than 75%. For more information on the adhesive products BBS Facades supply, visit the Fixings and Adhesives page. Face Fixing is considered the easiest and most cost effective way of installing facades. Timber or aluminium substructures can be used when face fixing. Fixings can be powder coated or match the colour of the board and are accompanied by a gasket in order to protect the timber and to give a shadow line effect at panel joints. An aluminium substructure is a lightweight and low maintenance alternative to timber. The aluminium substructure offers more flexibility for difficult projects as the system is fully adjustable and available in cavity ranges of 50 to 420mm. For further information on face fixing or installation, contact us now.